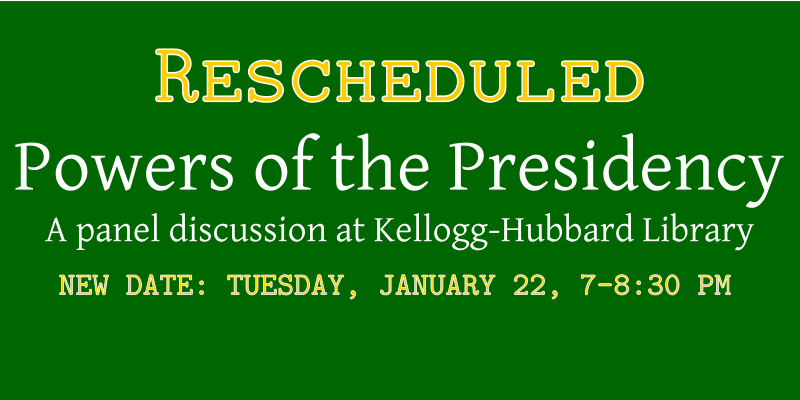 Due to inclement weather, the League panel discussion "Powers of the Presidency" scheduled for Wednesday, January 9, has been rescheduled for Tuesday January 22 at the Kellogg-Hubbard Library from 7-8:30 p.m.
Executive Power. Executive Expansion. Executive Overreach. Do we need to be concerned about concentrating too much power in the Presidency? Should we be worried about the use of executive orders to get around Congress? What are the limits to presidential authority? Checks and balances? On Tuesday January 22, (new date due to rescheduling), a panel of scholars will delve deep into the U.S. Constitution to answer these and other questions as they deliberate Powers of the Presidency, a subject of much discussion since the election. ▪ Matthew Dickinson, Professor of Political Science, Middlebury College, teaches courses on American politics, the presidency, and the politics of Congress. ▪ Lisa Holmes, Associate Professor of Political Science, UVM, specializes in judicial politics, constitutional law, gender and law, and American politics. ▪ Peter Teachout, Professor of Constitutional Law, Vermont Law School, is recognized for his expertise regarding constitutional law and history of Vermont and the United States. ▪ Marilyn Blackwell of the League of Women Voters will serve as Moderator. She is a writer and historian who worked at Vermont Historical Society and taught history at UVM, Norwich University, and Community College of Vermont. The program is open to the public and there is no cost to attend. Registration encouraged, lwvofvt [at] gmail.com. This event is part of the Constitutional Crisis? Speaker Series hosted by the League of Women Voters and Kellogg-Hubbard Library.